1 Put figs in a bowl and cover with hot water. Soak for 30 minutes. Remove fat from chicken thighs and cut meat into bite-sized pieces. Trim leeks both ends, cut in half down the length, wash well, then slice. Rinse preserved lemon rind, discarding pulp. Chop rind. 2 Drain figs and cut into quarters. Put leeks and figs in a medium frying pan (skillet) with 1½ tablespoons oil and white wine. Cook gently for 10 minutes over a medium-low heat. Once the mixture has softened and lost bulk, lower heat and cook gently for another 5 minutes, until tender. Stir in nutmeg, ginger, lemon rind and ¼ teaspoon salt. Transfer to a plate, scraping out all the juices. Wipe out the pan. 3 Add 2 tablespoons oil to pan and set pan over a medium-high heat. Put flour in a bag with ground coriander seeds and ¾ teaspoon salt. Shake to mix, then add chicken and shake again until chicken is coated in seasoned flour. Add to pan and cook until golden; the chicken doesn’t need to be cooked right through at this point. 4 Add stock, bubble up, then simmer for 5 minutes. Mix in leeks and figs, scraping in all the juices, and add lemon juice. Cool. 5 Roll out very thinly slightly less than half the pastry and cut into 4 large roughly round shapes. Fold rounds of pastry in half then half again and lay them inside small and deep individual spring-form pie or cake tins. Straighten up pastry and press it against sides of tins, letting it come above the rims of the tins if possible. Chill. Roll out remaining pastry and cut out 4 rounds. Chill. 6 Preheat oven to 200°C (400°F)). Have a baking sheet heating on a rack in the middle of the oven. Remove lined tins from fridge and brush rims of pastry with a little water. Fill with chicken and fig mixture, flop rounds of pastry on top and gently press pastry edges together. It needn’t be neat – keep it rustic! Make a hole in the centre of each pie, then brush with egg wash.
7 Transfer pies to heated baking tray. Bake for about 20 minutes, until a good golden brown, then lower heat to 150°C and continue baking for a further 10-15 minutes, or until pastry is a really good golden colour. Cool for 10 minutes before unmoulding and serving. When you add the chicken to the pan, just leave it where it lands. If you start fiddling with it or moving it around with tongs, it will lose heat then it will start to stew. If lining the tins with pastry doesn’t quite work out how you hoped, don’t panic, just patch things up. Puff pastry is quite forgiving. 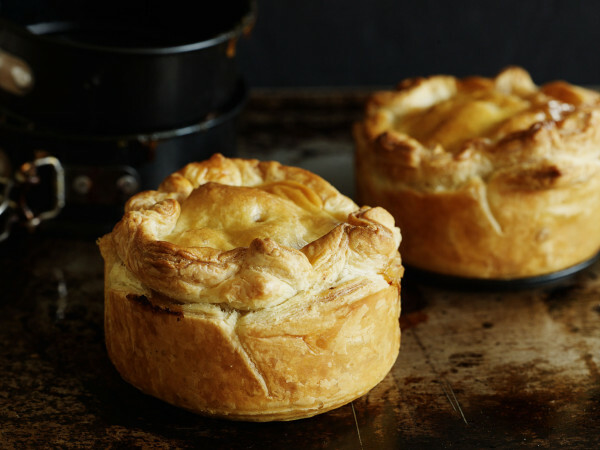 If the thought of lining individual tins scares your pants off, just make one large pie. There may be some chicken filling left over (it depends on the size of your tins). Keep refrigerated and use in a smaller free-form pie within 48 hours. Here's a way to create succulent chicken bursting with flavour. Be a pie nerd and get the lowdown on making great pastry.